>I cannot believe that I’m blogging about this incident, but it’s true and I’m just keeping it real. My latest fad is an attraction to anklets and bracelets made of materials like hemp and leather. On one recent shopping trip, I purchased quite a few bracelets. I chose a few cool pieces mainly due to their bright and vivid coloring. Black clothing dominate my work clothes because it’s easier and quicker to put an outfit together at 5:00 a.m.. I’ve learned that adding a spice of color through accessories is simpler for me. The process of coordinating my bracelets, earrings and other jewelry pieces with my outfit is less time consuming. Anyway, few weeks ago I was excited to sport my cool black natural fibered bracelet with rectangles painted bright yellow, red, and green. Fast forward to around 8:00 a.m. the day that I wore my bracelet to work. I’m sitting in my office, easing into my work day. I gingerly glance down at my bracelet smiling and admiring its beauty. At that moment, I realized that the pretty “tropical” plants looked familiar. I stopped to take a closer look. “Hmm…. this isn’t good,” I thought. No, it can’t be! I put my reading glasses on! Perhaps I need to wear my glasses when I shop now. I take a second and third look. OMG! 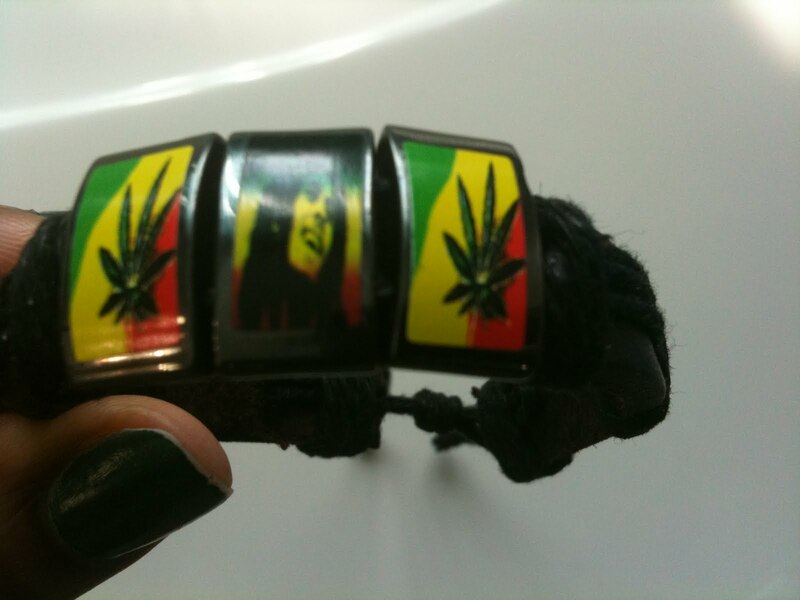 I am horrified to discover that the damn tropical looking plants on the side of my bracelet are marijuana plants!!! What the heck?!?! Duh! I forgot to mention Bob Marley’s pic! At the time of my purchase, I had no idea of the art work depicted on the bracelet. Just wasn’t paying close attention. I don’t use drugs nor do I make it a habit of buying merchandise that contain pictures of drugs. I work with teens and pride myself in setting a positive example for students. Jeez! What an airhead! Needless to say, I made an immediate adjustment to my adored accessory on this morning and the bracelet never became visible to students. I am so glad that I realized this outrageous snafu before any students got a chance to see it. For sure, I learned my lesson the hard way. Stay “present” woman! The irony is that I tell both my kids all the time, “pay attention!” He he! The jokes on me. Doggone it! Pay attention Tanya!